Tony Brasunas grew up in West Virginia in an intentional spiritual community, attended a large public high school in Atlanta, and matriculated at a small New England college. When he’s not writing, he’s working in the field of solar energy, playing guitar or soccer, or traveling to faraway lands with his wife. My adventures in China transformed who I am, changed my life, and provided the inspiration for Double Happiness. When I left the US, I was 22 years old and pretty lost; I didn’t know who I was. I went to China, somewhere I was completely isolated and alone, and through a year of teaching and traveling throughout the country I learned ways to be the person I’ve always wanted to be, and to find happiness — to find a way to be a happy person — that I didn’t know existed. When I returned, I was inspired to share the experience with others in the hope that the lessons I learned would be of use to others. I finally decided to write a book. 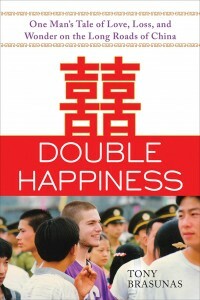 If Double Happiness reaches other people, if it reaches even one person, who through reading this story learns a little more about how to be happy, that we don’t have to suffer, and that we’re meant to be ourselves, to be who we already are, to come awake and come alive — the book will have achieved its goals. I start with the need-to-write parts, the parts of the story that are just screaming to play out on paper. The scenes and the descriptions and the words usually just flow for these parts, and they establish their own tone and mood. Then I outline the other parts and go in and write the most important parts first. Then revise, revise, revise. Make it sing. When you write the most important, juiciest parts first, you often discover the other parts don’t even have to be written. You combine and pile onto those important parts bits of the other plot elements and character development. Memoir and creative nonfiction writer here. I hear my characters speaking, because they really exist! Follow your love and inspiration. They will take you where you need to go. I went both ways for a while, and then settled on the independent route. Double Happiness is a tale of trusting one’s own intuition, of letting it lead you through the world, so it was a natural choice. Certainly there are pros and cons to both routes. At the end of the day, the biggest difference is that traditional publishing gives a better imprimatur on your book’s spine and more prestige in the publishing world; independent publishing gives you more freedom, power, and creativity. In either case you need to learn how to write and write an excellent book, and you need to learn how to publicize and market your writing if you want to make money at this art. The future of this art is bright. The need for humans to share, tell, and hear stories will endure as long as we have ears, tongues, and hearts.